Book Review - The Long Way to a Small, Angry Planet by Becky Chambers - Honk if you love justice! I got my latest read, The Long Way to a Small, Angry Planet as a gift, and had a great time reading it. The first novel from Becky Chambers, it follows a young woman named Rosemary as she joins the crew of a tunneling ship (basically they make shortcuts through space) as they get a big contract that could very well set them up for bigger and better things in the future. But with that comes danger, especially in a universe where humanity is NOT at the forefront of the great intergalactic governing body, but a minor cog. The cast of characters are adorably quirky, with the long-suffering Captain Ashby putting up with all sorts of shenanigans that would feel at home on Farscape or Firefly. I also love the care that was taken to make the aliens truly alien. Cold-blooded aliens, aliens with differing numbers of limbs, aliens that are symbiotic with a weird virus, the works. The story of the tunnel the ship needs to make is the overall driving force of the story, but most of the book is a series of what feels like episodes, with each crewmember having an adventure or getting some backstory in. 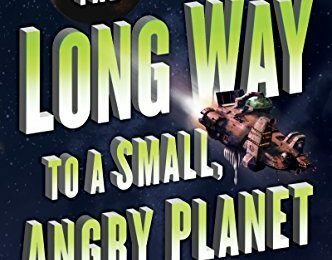 If you’ve been overwhelmed by Dark and Gritty™ sci-fi or are in the middle of a 74-book high fantasy slog and need a break, The Long Way to a Small, Angry Planet works great. It manages to be light and fun and still have a lot to say about gender, relationships and artificial intelligence.